Hello from way up in the sky. I am currently on my flight home to LAX from Philly. We have just finished up our trip to the east coast for Christmas. This year we spent the holidays with Jared’s family in suburban Philadelphia. This was our second Christmas spent together out of the 4 years of our relationship and our first time at Jared’s childhood home for the holidays. We spent Christmas with Jared’s Dad, his older brother Nate (Dr. Storb) and his lady from Texas. It was a nice group of five. Jared’s mom unfortunately passed away a few years prior so the holidays are a little tougher than usual. We did our best to make them enjoyable and remember her whenever possible. I actually cooked my first Christmas dinner this year! I’ve done Thanksgiving once before but Christmas was a new experience for me. There we’re quite a few opposing factors on my side. I was so nervous that if I had ruined dinner I wouldn’t be able to laugh it off (because I was totally out of my comfort zone in a new kitchen) or say ‘I’ll try again tomorrow!’ like I do with a new blog post fail. This was the big holiday league and to top it all off I got the worst chest cold I had, had in like 5 years! I don’t know how I managed to pull it off but I actually did. By the time 7pm hit we all had full bellies and I was gracefully passed out with my mouth wide open on the couch. Talk about being on my best behavior #hotmess. Luckily, Jared was my sous chef and got me an awesome new Japanese chef’s knife for Christmas that kept me inspired through out the day. The menu ended up being a whole turkey (rubbed with compound butter), Brussels sprout gratin, crab mac and cheese, sweet potato casserole, traditional stuffing, apple pie and a huge spread of cookies from Jared’s mom’s recipe archive. On Christmas Eve, Jared’s Dad pulled out a huge basket of his mom’s mismatched and food stained recipes that the boys used to eat when they were kids. Jared pulled out white chocolate macadamia nut and peanut butter cookies to try and replicate. The last thing I wanted to do was mess up these traditional and sacred cookie recipes. Luckily, after the first bite of a peanut butter he turned to me and said ‘these taste just like Mom’s’. For a moment it felt like she was in the kitchen with us. It was a very Christmas hallmark kind of moment but extremely special nonetheless. It was a great trip and I am so happy that I was able to experience the Holidays from a different perspective. I am equally stoked to get back and dive head first into the New Year. I am so excited to start my first official year of doing this blog full time. I have been brainstorming editorial content all month! I can’t wait to start bringing you guys consistent and fun content each week! I wanted to kick off the New Year in a light and refreshing way! One, because my diet has consisted of carbs and cookies the last two weeks and two I am excited for a much lighter and refreshing pace of life. 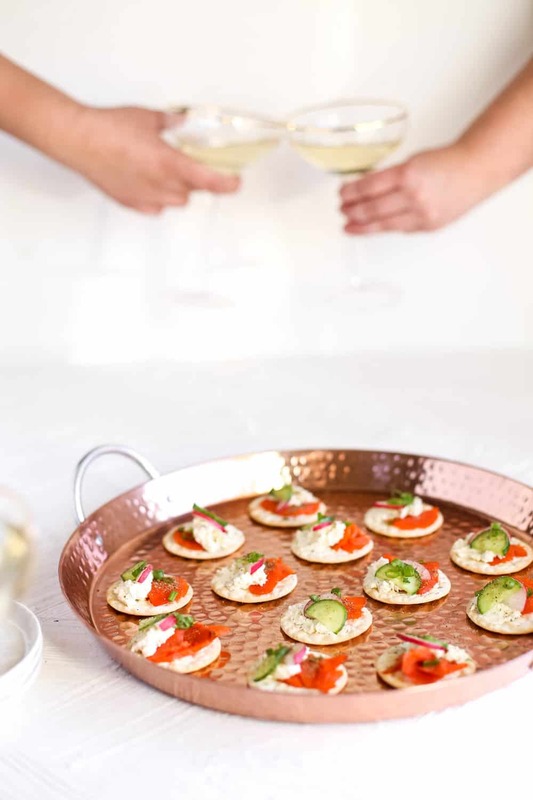 Today’s salmon bite appetizer recipe is a blend of just that. 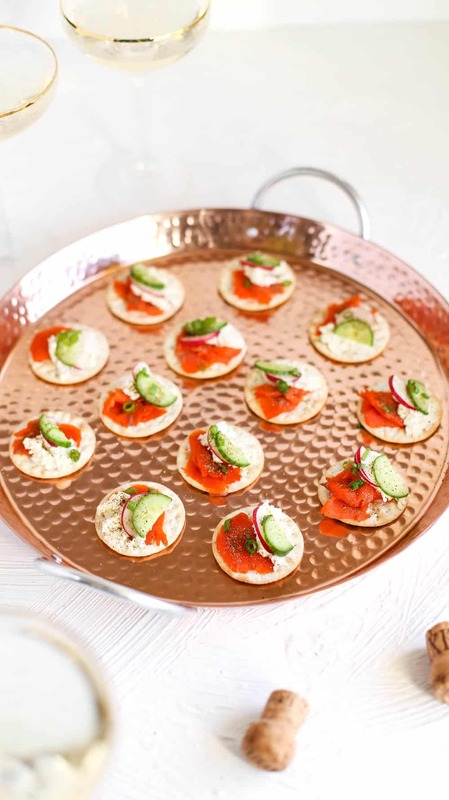 Believe me when I tell you that you can put together a whole tray of these in less than ten minutes and you will look like a professional caterer! Plus these bites taste freaking delicious. They are the simplest ingredients blended together for a lite cocktail appetizer. I had two friends over while I was recipe testing these and that same weekend they made them for a party of their own. When my friend’s start making recipes from my blog I know it MUST be easy because none of them are huge cooks! 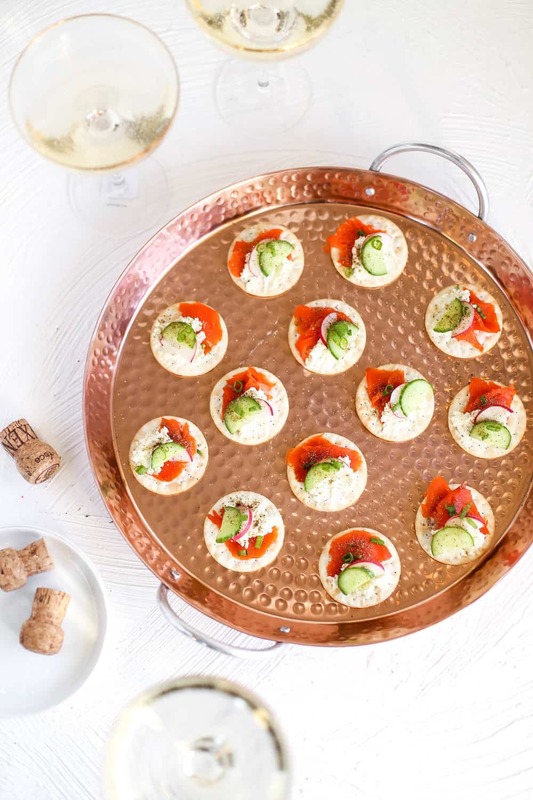 If you’re having a cocktail party for New Years Eve give these bites a try! 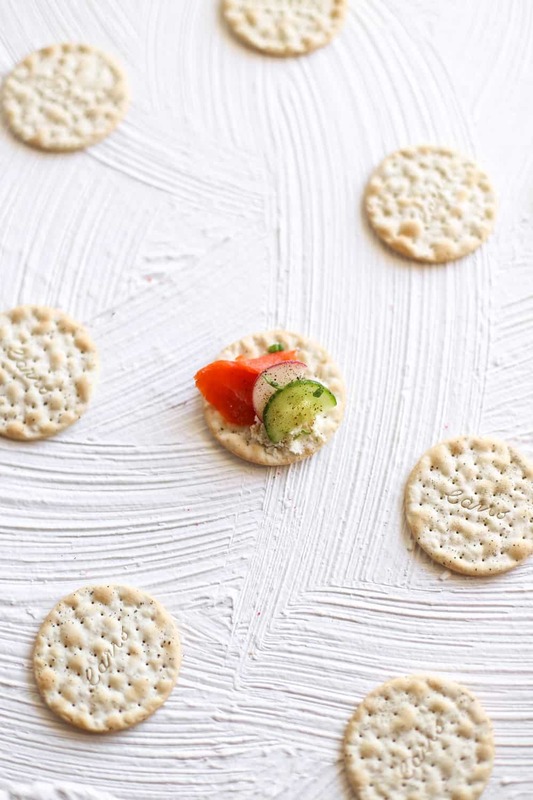 The smoked salmon paired with cucumber and just a smidge of cheese give these light crackers make this a flavor powerhouse. 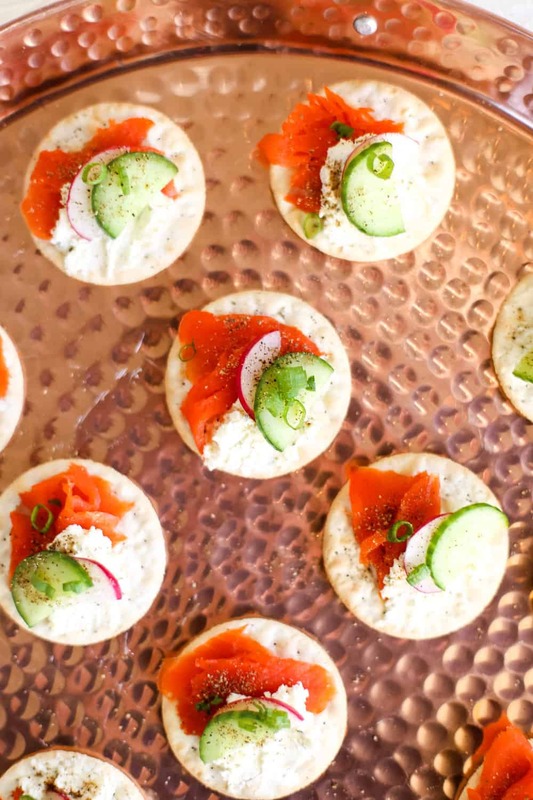 They almost remind me of ‘spa’ appetizers. Light enough for diets but wholesome enough for people like my Dad.